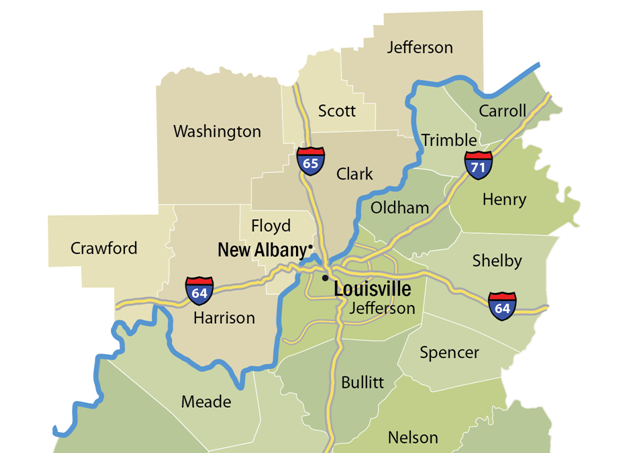 Anchorage, Audubon Park, Bancroft, Barbourmeade, Beechwood Village, Bellemeade, Bellewood, Blue Ridge Manor, Briarwood, Broad Fields, Broeck Pointe Brooks, Brownsboro Farm, Brownsboro Village, Buckner, Buechel, Cambridge, Charlestown, Cherrywood Village, Clarksville, Clemont, Coldstream Crandall, Creekside, Crestwood, Crossgate, Douglass Hills, Druid Hills, Fairdale, Fairmeade, Fern Creek, Fincastle, Floyds Knobs, Forest Hills, Fox Chase, Glenview, Glenview Hills, Glenview Manor, Goose Creek, Goshen, Graymoor-Devondale, Green Spring, Greenwood, Hebron Estates, Henryville, Hickory Hill, Highview, Houston Acres, Hunters Hollow, Hurstbourne, Hurstbourne Acres, Indian Hills, Jeffersontown, Keeneland, Kenwood, Kingsley, La Grange, Langdon Place, Lebanon Junction, Lincolnshire, Louisville, Lyndon, Lynnview, Manor Creek, Maryhill Estates, Meadow Vale, Meadowbrook Farm, Meadowview Estates, Middletown, Minor Lane Heights, Mockingbird Valley, Moorland, Mount Washington, Mt. Eden, Murray Hill, New Albany, Newburg, Norbourne Estates, Northfield, Norwood, Okolona, Old Brownsboro Place, Orchard Grass Hills, Park Lake, Parkway Village, Pewee Valley, Pioneer Village ,Plantation, Pleasure Ridge Park, Plymouth Village, Poplar Hills, Prairie Village, Richlawn, River Bluff, Riverwood, Rolling Fields, Rolling Hills, Sellersburg, Seneca Gardens, Shepherdsville, Shively, Simpsonville, South Park View, Mill Spring Valley, Springlee, St. Dennis, St. Matthews, St. Regis Park, Strathmoor Manor, Strathmoor Village, Sycamore, Ten Broeck, Thornhill, Valley Station, Waddy, Watterson Park, Wellington .West Buechel. Westwood, Whipps Millgate, Wildwood, Windy Hills, Woodland Hills.